Are you a home cook with a real passion for food or simply a foodie that loves dining out and grabbing shots of food on your travels? If you are either I am sure you are tuning into reality cooking shows like MKR and following the many food lovers on Instagram. At least two years ago I stumbled upon an Instagram page that I really loved called ‘Homemade Foodie’ working in the food industry for many years and now with Hospitality Products providing products to Chef’s, Restaurants, Bars and Home Cooks, I was intrigued. I also have a love of good nutrition and enjoying cooking at home myself, so I started to follow who I now know as Emma Lamberth. A wife to Troy and mum to Ava and awaiting the birth of their second child, this soon to be a family of four is very fortunate to have the talented Emma as their ‘home cook’… Scrolling through this feed, I have moments of drooling at my desk or regret for the simple tuna salad or soup I have for my lunch. Visually Emma’s food is always so well presented, which makes it understandable that Channel Seven tracked her down in recent days to assist in a Queensland marketing campaign for the most recent My Kitchen Rules season that is underway. Having an Italian background yet born here in Sydney, majority of Emma’s cooking is European inspired however with the occasional Asian dish creeping in from time to time. I guess having grown up swapping her ham and cheese sandwiches at school for her friends Lebanese cuisine was a hint to Emma’s love of food and flavours. ‘My favourite cuisine to eat would be Japanese – Specifically Tonkotsu Pork Ramen and Kingfish Sashimi. Offering a ‘realness’ to home cooks, Emma is able to showcase home cooked food, plated well but still achievable. Whilst we all love watching reality tv shows, at times I it can feel that the dishes served are more restaurant style than home cooking, the talent might be there to pull it off (sometimes, not always) but I am not sure if all dishes are always suited to the home and the ability of many. So I love that following Emma ‘homemade foodie’ via Instagram shows that everyone can achieve these nutritional dishes in their homes for their families. Presentation can still be achieved with the right products and a little creativity, it isn't always the case of having to have truffleson the menu or and fancy technique to debone a whole fish.. Simple cooking using quality ingrediants and the right products can sometime be all you need to enjoy what you do and what you create in the kitchen. 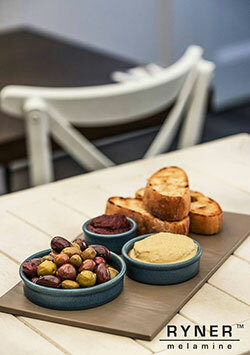 We’ve partnered up to offer some of our tableware to Emma to showcase her creations. We just had to share some of these images with you all and hope that if you too cook good food for people to enjoy and have a true love of all things in the kitchen then join me in following Emma in the kitchen. For any of these products or anything else for your kitchen, home, restaurant, café etc our website link is below. Don't forget any aspects of the kitchen we are here to help.